It’s that wonderful time again, #icecreamthurs! Cairns has a wonderful night market, which we managed to visit after a day-long bus tour of the Atherton tablelands (such beautiful countryside). We were pretty tired, but it was a lovely warm evening, and we couldn’t help but notice Bellissimo. There was a buzz around the gelateria, and when we approached the display it was clear why – there’s a huge range to choose from, and the flavours range from the traditional lemon to red bull! The ferrero rocher option quickly caught my eye and the friendly lady piled up an architectural miracle in the small cup I ordered. I couldn’t believe the amount of gelato I got! I was also really impressed with the service – the staff were attentive to each customer and were very welcoming. 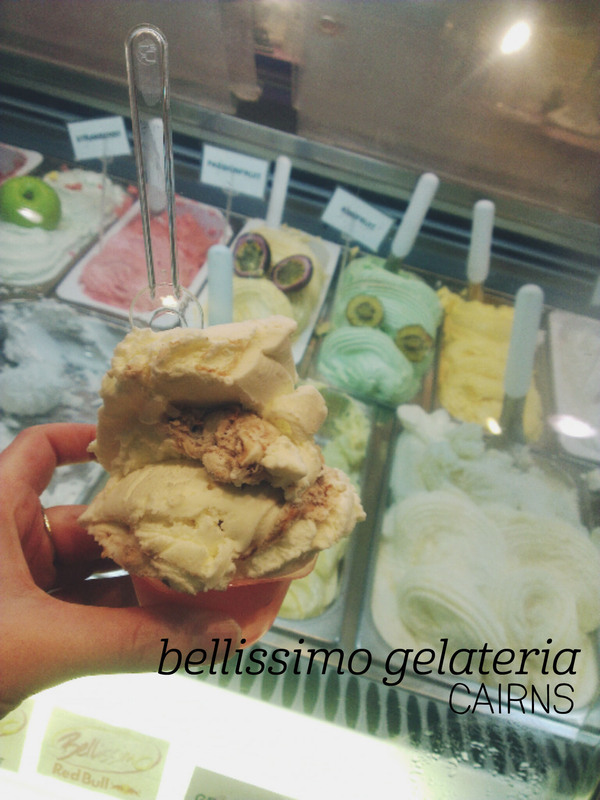 The gelato itself had a lovely flavour to begin with – like biting into a cold ferrero – but it did fade the more I ate, which was a bit disappointing. The texture was lovely and creamy, and we enjoyed eating our icecreams while having foot massages at the markets. I couldn’t quite finish mine, but it added to the lively atmosphere of a night at the market. I like cafes that have some kind of theme going or some definitive character to them. Candy Cafe is one such place. The first thing that strikes you is the decor – chandeliers, plastic hedges and a huge mural of fairytale stories on the long wall. Kitsch, but in a way that works. Looking at the breakfast/brunch menu, I was drawn to ‘the Usual’, which includes poached eggs. 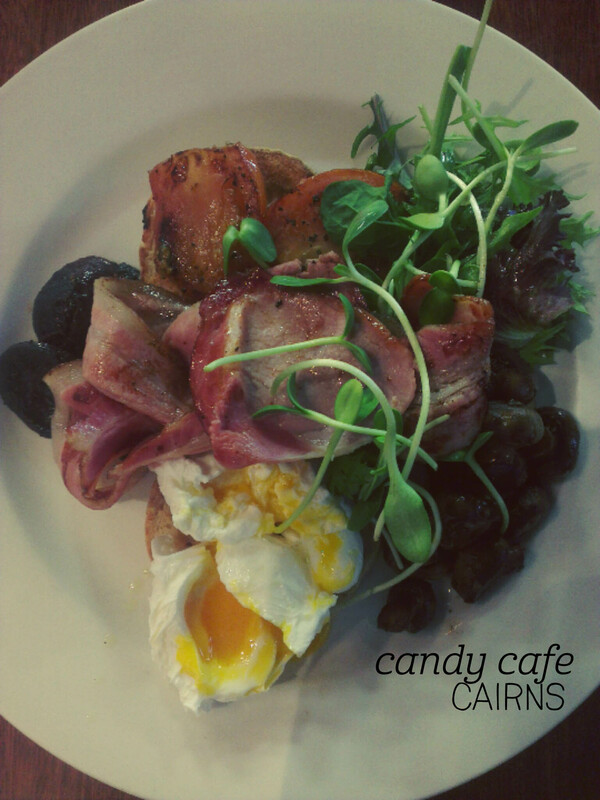 fried mushrooms, roasted tomatos, bacon and… black pudding! Order decided. I also had a ‘Citrus Sunshine’ juice of orange, pineapple and lime, which delivered on its name, both in terms of citrus deliciousness and sunshine in helping me to wake up! Brunch came out in good time, and when I cut into the eggs they were perfectly poached, the yolk running onto the muffin and softening it up. The greens were a bonus not mentioned on the menu, but a nice addition to cut through the richness of the bacon and black pudding. The tomatos kept their shape when cut and the mushrooms were full of earthy flavour. Every mouthful was delicious, and in such beautiful surrounds, who could resist? When I saw that Ganbaranba wasn’t just a ramen shop or a noodle restaurant, but a ‘noodle colosseum’, it was pretty much compulsory to eat there. Though I swore to try and gladiator my way through all of the ramen on the menu, I only managed to get there twice. On both occasions we shared some gyoza to start, and they were incredible – beautifully pan-fried with extra crispy bits hanging off each dumpling and a soft and tasty filling. Round one was the traditional tonkotsu ramen – I found the broth to be a bit oily, and the pork was quite tough, but the ramen had just the right amount of bite. Round two was all about the shoyu – the best ramen of my life was in Kyoto in 2009 and it was a shoyu ramen. It’s not as common to find soy-based broths in Australia, and so I always try them when I can. Whilst it wasn’t Kyoto-standard, this shoyu was really tasty, full of bamboo shoots and again perfectly bitey ramen. Ganbaranba’s staff were super friendly and made us feel welcome, so they get the thumbs up from me. 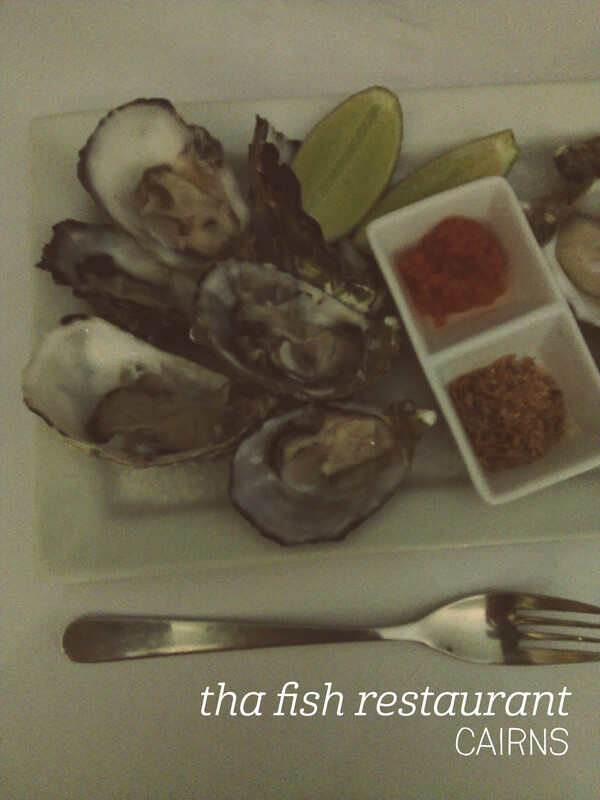 It’s pretty much impossible to go to Cairns and avoid seafood – a group of us decided to embrace the inevitable seafood feasting and booked in to Tha Fish. With the fancy esplanade location, we expected great things. We ordered a dozen natural oysters to start, which came with chilli jam and Asian-style fried onion crisps. The first oyster I had was fresh and flavoursome and enlivened by a drizzle of lime. Each of the following ones were a little less tasty than the first, but still satisfied my craving. Choosing a main was tricky – the menu has so many options – but in the end I picked a fillet of barramundi served with cous cous, dukkah and labne. The cous cous was moist and suited the barramundi, which was quite large and cooked to perfection. The crunch of the dukkah and the creaminess of the labne really brought the best out of the fish – definitely a winning combination. The staff were very attentive and the service was excellent, although fair warning, good fish does come with a high price tag – in this case it was well worth paying. 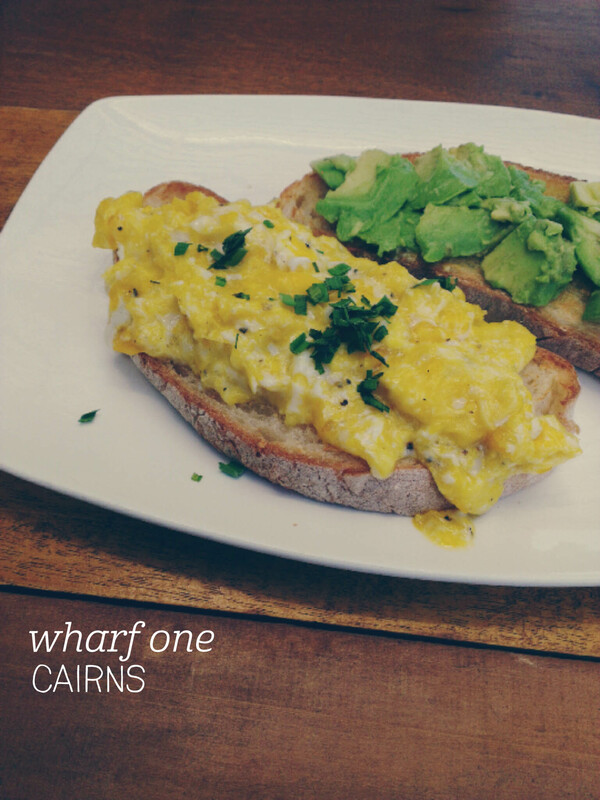 I was pretty excited to discover that Wharf One did breakfast – I’d had icecream there on the waterfront and admired the view, thinking, this would be a great breakfast place. They were way ahead of me. I came back the next day and ordered the ‘broken eggs’, not entirely sure what that meant but excited to have avocado, and a classic banana smoothie. The smoothie came out first, while we sat enjoying the sunshine and light breeze, and it was exactly what you want a banana smoothie to be – sweet and obviously full of fresh bananas. Mmm. When the broken eggs arrived I was intruigued by the colour – the egg white seemed more cooked than the yolk, making it something in between scrambled and poached. It was actually just the right consistency, and when combined with the avocado served on another piece of toast it was one of the best breakfasts I’ve had in a long time. The seats are nicely spaced apart for privacy and the open structure is designed to allow maximum enjoyment of the weather and the view, both of which were just as lovely as the food! When one of my friends suggested going to a burger place for lunch in Cairns, I was a bit hesitant – why eat a burger when there’s such good Japanese and Korean food in town? But he insisted this was no ordinary burger place, and so I found myself at re:hab. The first thing that strikes you is that re:hab could fit in quite easily on Lonsdale St – it’s got chalkboard walls with art on them, wooden floor boards with shipping brands imprinted on them, and an ecclectic mix of chairs and tables. We went for the leather armchairs, and I decided to order the tropical burger (being in Queensland and all). The burger was massive, a thick, well-cooked patty topped with tomato, lettuce, aioli and pineapple on a soft and slightly floured bun. Yum-o. It came with re:hab potatos on the side, a bit heavy in the warmth but very tasty. 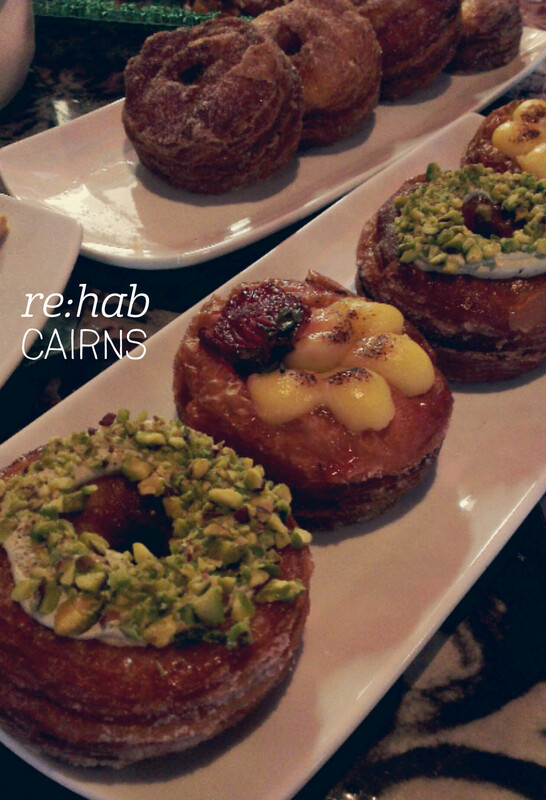 Finally, as if re:hab hadn’t ticked enough boxes, there was a plate of cronuts sitting on the counter, calling out my name (ok, not really calling, more like whispering). Such a great find, a definitely not your average burger place. 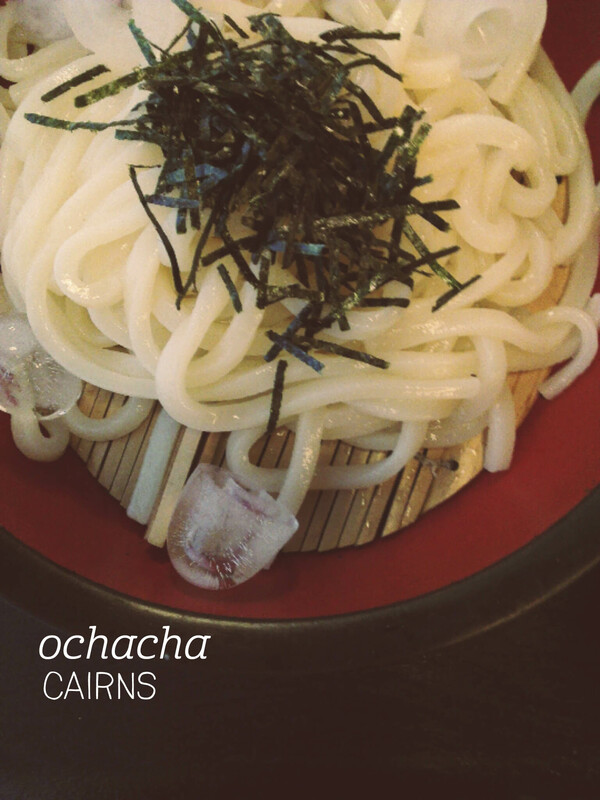 When you Google ‘best Japanese in Cairns’, Ochacha is the first place to come up on the listing, and for good reason. I went on a Monday, which is lucky because they are closed on Tuesdays, for both lunch and dinner. I dined alone at lunch, and had a lovely chat in Japanese with the waitress who was visiting on a working holiday. It was a particularly hot day, so I opted for the zaru udon, cold udon noodles in a dipping sauce. The meal was so refreshing – the noodles were beautifully chewy and the flavour of the sauce took me right back to Japan. Having had such a nice lunch, I took my friend back there for dinner, and we feasted on sushi and sashimi. The aburi salmon nigiri sushi was the highlight, although I was impressed by the relatively large pieces of salmon and tuna sashimi on the two plates I ordered. The miso soup was hot, flavoursome and not too salty. My friend also ordered the chicken katsudon and we were both stuffed full of delicious Japanese food by the end. 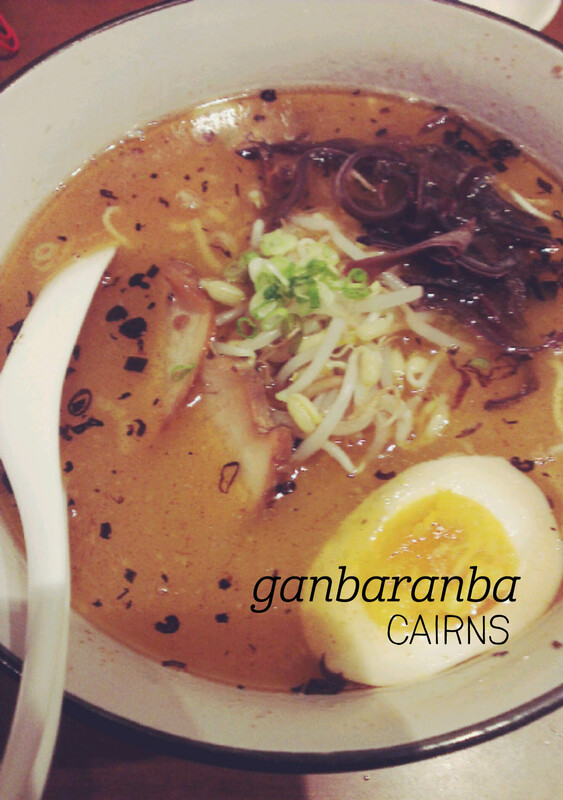 A must-visit for Japanese food fans.